Farmers Holly Whitesides and Andy Bryant grace the cover of the June/July 2013 issue. From determined Virginia cattle farmers to entrepreneurial vegetable growers in eastern Kentucky, the latest issue of The Appalachian Voice showcases the resourcefulness and resilience of our mountain farmers. In our features, Today’s Farming Frontier looks at how growers are adapting to changing markets. 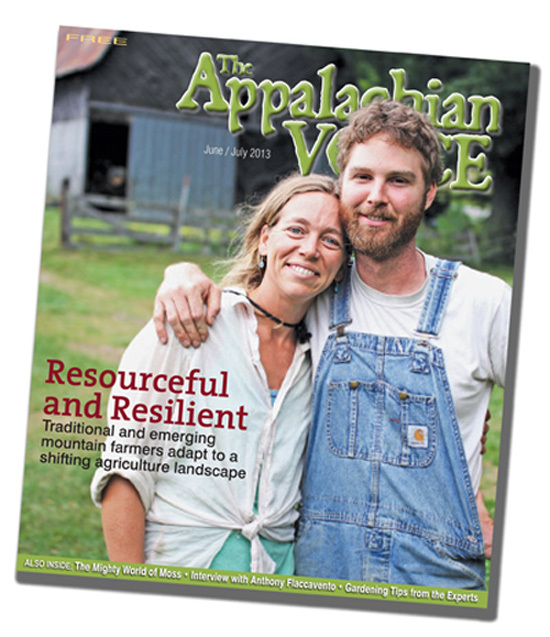 A special three-page section explores Appalachian farm ownership. In A Matter of Self-Preservation, writer Matt Grimley explores how aspiring farmers are struggling for land access and the ways family farmers are passing down the business. He examines the issue from a land ownership point of view in Making it Last, where he studies how aging farmers can plan for their farm’s future. Former Appalachian Voices editorial intern Davis Wax explores the controversial aftermath of pesticide use in Toxic Legacy: Yesterday’s Pesticides, Today’s Problem. And in Addressing Food Insecurity, writer David Brewer speaks with some of the movers-and-shakers who are working to close the gap between healthy, local food and the consumers who need it most. In addition to those farm-oriented features, we take several shorter looks at trends in Appalachian agriculture. Our editorial intern Alix John discovers the world of seed-saving and heirloom plants, and Brian Sewell examines how climate change might impact farming in our region, and surveys the growth of Appalachian agritourism. Using electricity wisely is vital for Appalachia, a region that has borne the burdens of our national appetite for cheap energy. Unlocking the Southeast’s vast energy savings potential could be the key to forging a cleaner, greener future. That’s the premise behind The Dollars and Sense of Energy Savings, our first-ever issue devoted to electricity conservation. This April/May issue is stuffed with 28 pages of stories, profiles and resources. 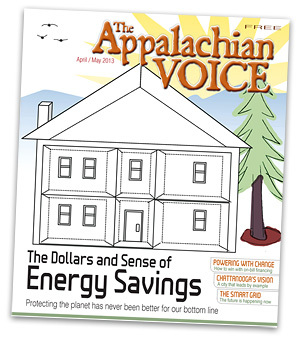 The Appalachian Voice is available free on newsstands across the region, and is delivered to the mailboxes of Appalachian Voices members. We begin with Power to the People, which takes a broad look at how different electricity providers approach energy efficiency — hint: companies such as Duke Energy have very different motivations than member-owned electric cooperatives. While researching the story Powering With Change, Matt Grimley discovers how member-owned electric cooperatives in South Carolina are finding ways to help homeowners trim utility bills while strengthening the cooperative as a whole. At grocery stores, coffee shops and libraries throughout the region, newsstands are filling up with spring peepers. We’ve chosen this little frog as the cover celebrity for “The Silent Majority” — the countless creatures that share our treasured Appalachian Mountains with us. 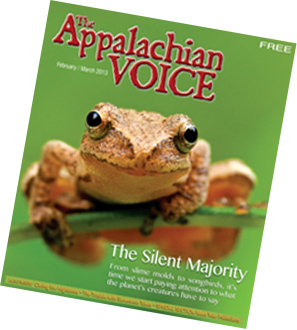 This issue of The Appalachian Voice is dedicated to understanding how the region’s wildlife are faring and listening to what they’re trying to tell us. We also feature a four-page politics pull-out section on some of the loudest voices in Appalachia, our representatives in Washington and our state legislatures. Is Environmental News Fit to Print? Spotting quality environmental journalism amidst the national media’s 24/7 tornado of he-said-she-said breaking news may have just gotten more difficult. The New York Times has announced it will close its nine-member environment desk over the next few weeks and assign its environment staff to other departments, according to Katherine Bagley for InsideClimate News. The best environmental coverage often depends on reporters and editors who are dedicated to the beat. They are experts in their fields. They have reliable sources, know the history of an issue, know what questions to ask and how to navigate sometimes conflicting scientific reports and long policy papers to provide the full scope of complicated issues that readers need. 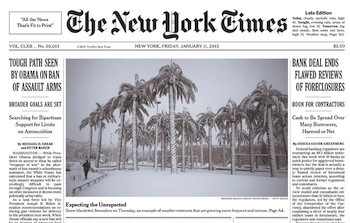 Although the paper’s managing editor for news operations told Bagley that the Times will continue to cover environment and climate, the fact that no one at one of America’s most prominent newspapers will apparently be focused solely on environmental reporting is disturbing. The Appalachian Voice typically looks inward, exploring the intricacies of our region. This time, however, we looked out at the rest of the world to see what Appalachia’s global ties could tell us about the life, history and struggles that take place within these mountains. 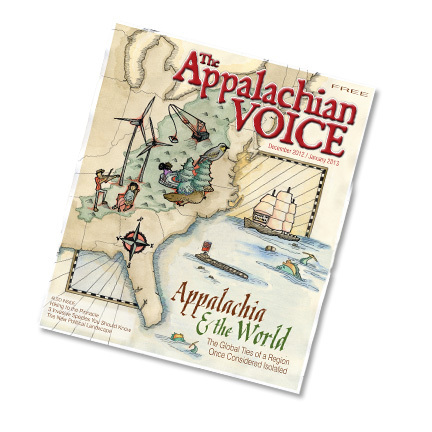 Take a moment to flip through the print version or visit our webpage, and let the latest issue of The Appalachian Voice take you around the world and back again. Our features begin with Global Connections, an introduction by our editor, Jamie Goodman, that showcases Appalachia’s worldly history and busts the myth of the region’s isolation. On the facing page, Finding a Common Language examines how Appalachia’s growing Latino population is striving for, and attaining, integration with mountain communities. Realizing that Appalachia’s energy future is closely tied to the pulse of the planet, we consider the best available energy forecasts in A Clean(er) World, which looks at how America fits into the future of electricity generation. Our centerspread, Uncharted Waters, features a global map that highlights some of the trends and hot spots in the international energy trade. Oct./Nov. issue of The Appalachian Voice is here! Every two months, a truck loaded with 61,000 new issues of The Appalachian Voice arrives at our office in Boone, N.C., and we gather ‘round — not just to haul the hefty bundles inside, but to see how our carefully chosen cover image looks in full color. Click here to flip through the print version. 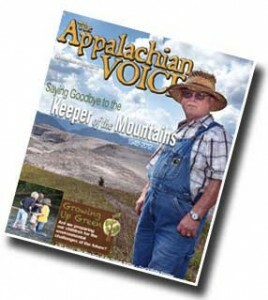 The striking image of Larry Gibson on this issue’s cover is one way that we can honor the Keeper of the Mountains — a true hero whose bold tenacity in the fight to end mountaintop removal coal mining inspired citizens around the nation to take action, including many of our staff and volunteers. Appalachian Voices’ Campaign Director Lenny Kohm pays tribute to Larry Gibson on page 3. And don’t miss the note from photographer Paul Corbit Brown on the inside cover. Motivated by the popular saying, “you protect what you love, and love what you know,” we devoted ten pages of this issue to education. These special Growing Up Green stories shine a light on the ways youth are connecting to and learning about the Appalachia that we know and love. 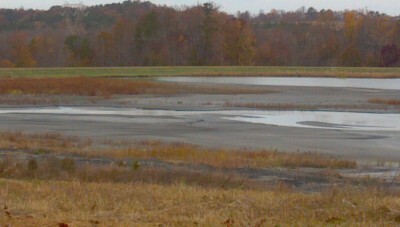 Coal ash, the toxic byproduct of burning coal for electricity, is typically stored in wet, often unlined, ponds. The most recent study, led by Duke University and published in the peer-reviewed journal Environmental Science & Technology, examined discharges from these ponds and how they affect lakes and rivers at different upstream and downstream points. Each new page in the Coal Ash Chronicles is dripping with more arsenic-laced water than the last. Arsenic concentrations in water flowing from coal ash ponds at Duke Energy’s Riverbend power plant into Mountain Island Lake, a primary drinking water source for Charlotte, were nine times higher than the federal drinking water standard. Near Asheville, coal ash pond discharges flowing into the French Broad River from Progress Energy’s Arden power plant had arsenic levels four times higher than the federal drinking water limit. Although this doesn’t mean that these cities’ drinking water itself is as contaminated as the discharge points, it shows a pattern of unacceptably high pollution from coal ash dumps. 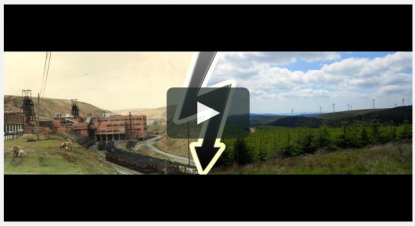 What happens to a community historically centered around coal mining when the coal runs out? The story of fossil fuels is a story of booms and busts, and reports indicate that Central Appalachia is on the brink of the greatest bust yet. Central Appalachian coal is running out — the U.S. Energy Information Administration anticipates a steep decrease in production — and the seams that remain are thin and difficult to mine. But as coal-impacted communities fight for a cleaner future and work toward a proactive economic transition, we’re not limited to knowledge of the here and now. Across the Atlantic Ocean, among mountains that are geological kin to the green ridgelines of Appalachia, communities in Wales have also dealt with fallout from the globalization of coal markets, decreased coal reserves and environmental degradation. An attentive audience packed into a room at Appalachian State University in Boone, N.C., yesterday afternoon to discuss what happens in coal-impacted communities when the coal is gone. The event, hosted by the Center for Appalachian Studies, brought together the Center’s director, Dr. Patricia Beaver, documentary filmmaker Tom Hansell, and celebrated regional sociologist Helen Lewis. The trio shared film clips from Hansell’s in-progress documentary, “After Coal: Welsh and Appalachian Mining Communities,” and from footage collected during the ‘70s and ‘80s by Welsh and Appalachian filmmakers. On Jan. 27, the North Carolina Utilities Commission approved a 7.2 percent rate increase for North Carolina ratepayers. The North Carolina Attorney General Roy Cooper and a coalition of state public-interest groups filed legal briefs detailing their opposition to the rate hike. The 7.2 percent increase is the result of an agreement between Duke Energy and the N.C. Utilities Commission’s Public Staff, which represents ratepayers. Duke Energy originally sought a 17 percent increase for residential customers. The Public Staff accepted comments on the matter and held hearings across the state before negotiating a lower figure with Duke Energy. Duke Energy said the $309 million in annual revenue from the rate increase will pay for capital improvements in power plants and pollution controls. But opponents of the rate hike, such as Al Ripley, Director of the North Carolina Justice Center’s Housing and Consumer Project, said that raising utility bills in the current economic climate will increase the number people who have a hard time paying. The North Carolina Justice Center filed a brief with two other state advocacy groups opposing the 7.2 percent rate hike. “By investing in energy conservation, weatherization programs and increased efficiency you can do what’s better for the environment and what’s better for people’s financial situations,” Ripley said. The brief filed by Attorney General Ray Cooper said that the 10.5 percent return on equity agreed upon in the current settlement is too high, and noted that the experts Duke used to justify the 10.5 percent rate of return did not consider the effect of current economic conditions on ratepayers. Read more about the finalized rate increase here. Check out a video of the Marion public hearing here and read about the High Point hearing here. Appalachian Voices recently had the honor of being inducted into the Allegheny Unitarian Universalist Church’s Share The Plate program, in which the church donates 50% of their quarterly tithings to a justice-related nonprofit. Our longtime field staff member Austin Hall was on hand last weekend to accept the church’s generous $1,250 check. 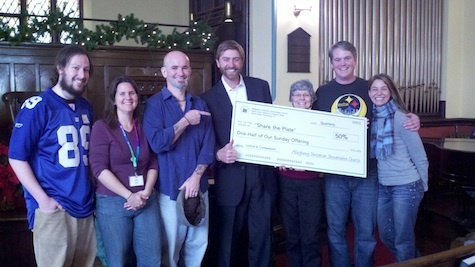 Allegheny Unitarian Universalist Church generously donated half of their quarterly tithings to Appalachian Voices. During his first Appalachian Treasures tour in Pittsburgh with Coal River Mountain Watch activist Junior Walk in 2010, Austin had the pleasure of meeting Shane Freeman, a local activist and congregate of the Allegheny UU Church. In all-star fashion, Shane maintained contact with Appalachian Voices. 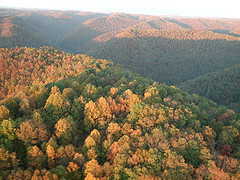 When Austin and Adam Hall, a West Virginia native and Keepers of the Mountains activist, embarked on their fall 2011 Appalachian Treasures tour, Shane helped schedule a presentation at the Allegheny UU Church. After seeing the presentation Shane organized, the Reverend David McFarland and the church board decided to sponsor us in the Share The Plate program. This was a tremendous honor, as all past recipients are predominantly from the greater Pittsburgh area. We’re honored and thankful to receive this donation from the Allegheny Unitarian Universalist Church, and proud to have Shane Freeman as a supporter. 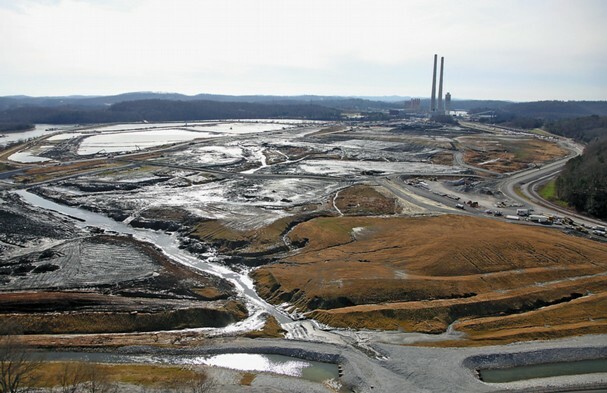 December 22 marked the three-year anniversary of the disastrous coal ash spill at Tennessee Valley Authority’s Kingston Fossil Plant. Residents of the damaged Swan Pond community are still struggling with the impacts of relocation and pollution. But the toxic effects of the more than 1 billion gallons of coal ash that flooded the Clinch and Emory Rivers are now affecting new neighbors. In Alabama, residents of the state’s poorest county have issued a civil rights complaint against the Alabama Department of Environmental Management, alleging that the agency is discriminating against the largely African-American community by allowing a nearby landfill to accept over half of the coal ash from the TVA disaster. The operation of the Arrowhead Landfill in rural Perry County, Ala. “has the effect of adversely and disparately impacting African-American residents in the community,” states the complaint, filed this week with the U.S. Environmental Protection Agency’s Office of Civil Rights by Florida attorney David A. Ludder on behalf of 48 complainants, almost all of them living near the landfill. Moving TVA coal ash to the Arrowhead Landfill in Alabama has been controversial since the deal’s approval in 2009. According to a blog about state corruption, investors and the Alabama Department of Environmental Management said the cash-strapped county would gain $3 million by storing the coal ash, and ADEM stands to make just as much. A citizens’ group called Impact Perry County filed a complaint alleging that the Perry County Commission violated the state’s open meetings and open records laws. 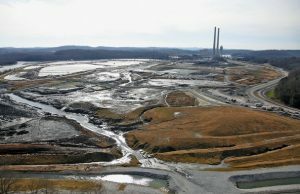 Further, the company behind the landfill, Perry Uniontown Ventures, was accused of a “take the money and run” scheme after it filed bankruptcy in Jan. 2010 to avoid environmental lawsuits, the Perry County Herald reported. The investors who are taking the bulk of the $95 million generated by the coal ash contract will never have to set foot in our county again once the landfill outlives its usefulness. They’ll never drink our water, or breathe our air, or eat bream from our creeks. They can call the shots from offices with glitzy addresses, never get a speck of ash on their hands, and endorse fat checks until those pristine fingers need a latte break. Can you? Coal ash is a dangerous by-product of burning coal for electricity that contains heavy metals such as arsenic, lead, mercury, manganese, and selenium that are known toxins. People living near an unlined coal ash pond are at a 1-in-50 risk of cancer from arsenic, a rate that is 2,000 times greater than the acceptable level of risk. Currently, the federal government has no authority to regulate coal ash, which is the nation’s second-largest waste stream after municipal garbage. Read more about proposed protections from coal ash here. While the EPA and federal government continue political wrangling and delays over regulation of coal ash disposal, the citizens of Perry County are calling out their state’s environmental agency, arguing that, by using Arrowhead Landfill as a dumping ground for toxic waste, the state is engaging in discrimination against the landfill’s neighbors.